Today’s feature comes to us from Greg Wagner of Nebraska Game & Parks, on the importance of releasing large catfish to fight again, whether they’re caught in Nebraska or anywhere across the nation. Did you see that? She released that big catfish back in the water! But, why? She should have taken that big fish home, cleaned it and ate it! Why do some people get perplexed when they see someone release a massive, master angler-sized catfish? After all, catfish, especially larger ones, sure taste good, don’t they? So why is it every time we see an angler report or post a mention or picture of a large catfish they have put back in the water, a spirited discussion, no scratch that, a huge dispute ensues over what is ethical? So how do we move beyond flaming the angler who chooses to release a sizeable channel, blue or flathead catfish? Allow me to inform you on why I am so passionate about and concerned with that whopper being taken home for the fryer. First, let me say that I have never judged any licensed angler who has kept a large catfish to eat, and I won’t as long as that licensed angler is obeying the laws and regulations set forth by the Nebraska Game and Parks Commission. But, let’s go deeper into the issue of catching and releasing voluminous catfish family members. Unlike other game fish, the growth of catfish is very slow. Actually, catfish are among the slowest growing freshwater fish in our part of the country. Texas Parks and Wildlife Department age and growth studies indicate that a 40-pound blue catfish could be 25 years old! A 30 inch blue catfish in Oklahoma and Missouri averages 10 to 12 pounds and is most likely around 14 years old! And, in Nebraska, Daryl Bauer of the Game and Parks Commission’s Fisheries Division adds that a 10 pound channel catfish is most likely dozens of years old! So, it takes a while for catfish to reach trophy and spawning sizes with some not even surviving adulthood under ideal or normal conditions. Also, with catfish, larger specimens pass on physical traits and survival instincts to thousands of young. Essentially, proper catch and release fishing improves wild catfish populations by allowing more fish to remain and successfully reproduce in an aquatic ecosystem in greater numbers. Keep in mind that mature catfish can lay anywhere from 4,000 to 100,000 eggs in cavities, and breeding males can fertilize as many as nine spawns a season if the eggs are removed from the spawn site each time. Furthermore, In-FishermanvMagazine’s Doug Stange, says statistical evidence suggests that once catfish attain a larger size they may continue grow exponentially by weight. One key, he says, to catching bigger catfish in any water body, is to limit the harvest of large fish, in favor of releasing them to be caught again and again. The practice of catch and release fishing provides an opportunity for increasing numbers of anglers to enjoy fishing and to successfully catch a memorable catfish. Your blogger shows you a hefty channel catfish caught and then immediately released in a private sandpit lake in western Douglas County, NE. Photo by Rich Berggren/Nebraska Game and Parks Commission. Catch and release fishing works but only if you learn to properly handle and care for big catfish. Brad Durick, renown channel catfishing guide on the Red River of the North in North Dakota, and longtime Nebraska Game and Parks Fisheries Biologist, Daryl Bauer, both unequivocally agree. Grab that rubber net. Unlike most fish species, catfish aren’t armed with skin-protecting scales. Instead, they have skin and secrete a viscous slimy substance that acts as an antiseptic. So for landing big catfish you need a knotless, rubber or rubber-coated net that won’t abrade their skin or remove their vital slime layer. A rubber-coated net with micro-mesh and a flat bottom panel is a optimum because it gently supports the fish without contorting its body in abnormal angles. Without a net, a large, wild catfish flopping on the boat floor, bank or dock is asking for trouble — broken equipment, sprained ankles and severely injured fish. Wear rubber gloves. In the case of handling big catfish, a variety of rubber gloves specifically designed to make gripping fish easier without removing their slime, should be worn. They should always be wetted first, before grabbing a fish, in order to be minimally abrasive. Gloves also have the added bonus of protecting anglers from catfish spines, sandpaper-like teeth and even hooks! No vertical holds! Fully support the weight of that big catfish fish with both hands and hold it horizontally. Keep hands away from gills and gill openings. Grip the narrow body section just below the tail with one hand and then basically cradle the fish’s head and shoulders with the other, avoiding pectoral and dorsal fins completely. If the fish decides to shake, you simply keep a firm grip on the tail and keep its head balanced until it calms down. It’s an safe, easy grip that just works. Use good quality circle hooks. A huge part of proper catch and release for substantial catfish involves the use of circle hooks and and preferably higher quality, tournament grade circle hooks. Good circle hooks are a must for hooking catfish safely and securely. Employing tournament grade circle hooks, allows nearly all of big catfish to be hooked in the corner of the jaw. This allows for a quicker hook removal, causes less stress on the fish and shortens time that the fish has to be out of the water. Carry long-handled needle nose pliers. Long-handled needle nose pliers let you to remove hooks with better control and limit your “hands on” contact with big catfish. Fish that are barely hooked or hooked in the lip can usually be freed with your hand, but it’s a good idea to always have a pair of long-handled needle nose pliers for those harder to reach hooks. Take quick pics. Take a few quick Smartphone or iPhone pics (photos) of the big channel, blue or flathead catfish you landed to preserve the memory of that trophy catch, and then put the fish gently back in the water right away. Practice conservation, practice CPR — Catch, photo and release! Just think, next week, the large catfish you released could be the biggest catfish some other lucky angler ever caught! Be prepared. Are your rubber gloves or rubber net and pliers within reach? Is your camera ready? Anything you can do to get that big catfish back in the water as soon as possible helps to improve the odds for survival. If you have everything you need handy you won’t have to keep the fish out of the water for very long. Little, long and cut. Catch and release fishing for weighty cats works if three basic tactics are remembered and followed: Play the fish as little as possible, keep the fish in the water as long as possible and cut the line if the fish has swallowed the hook. “Game fish are too valuable to be caught only once” – Lee Wulff, Widely Acclaimed Fly Fisherman. This entry was posted in catfish, Conservation on June 28, 2017 by ronniegarrison. How Can I Catch Giant Winter Catfish? While a lot of folks were still recovering from their hangovers on New Year’s Day, 76 boats headed out on a chilly Lake Wheeler in pursuit of the giant blue catfish of the Tennessee River system in the annual “Winter Blues” catfish tournament put on by the Alabama Catfish Trail. Fishing for these catfish is a whole different ballgame from going out to land a few pan-size cats for dinner. Blues reach enormous size–the International Game Fish Association (IGFA) all-tackle record now stands at 143 pounds–and there are few places where the big ones are more abundant than in the lakes of North Alabama. The current Alabama state record, 120 pounds, came from Holt Reservoir not far from Tuscaloosa, and the former record, 111 pounds, came from Wheeler. Blues reach lengths of almost 5 feet, and the largest have girths approaching 4 feet, according to the IGFA. Several blues over 200 pounds and one over 300 pounds were reported in newspapers of the 1800’s from the Missouri River, but whether these weights were anywhere near accurate is anybody’s guess. Biggest catfish in the Winter Blues event was not record class, but Team Magness from Mississippi did manage a 72.58 pounder, the heaviest fish for the event. The team with the heaviest total weight for the event, Tammy Strouth and Brian Lawson, had a fish that went 68.69 pounder as part of their three-fish total bag of 168.9 pounds, while the second place team of Nick Diminio, Adam Long and Doug Jolly brought in a 69.58 pounder as part of a total bag of 151.9 pounds. While the giants are most often found in the deepest holes in the river or directly below the dams in summer, in winter they spread out to feed on river points, shell beds and sandbars, and the big ones are evidently most active in the colder weather. Blues eat just about any type of fish, but they seem to have a special preference for a herring-like baitfish called the skipjack, which is found naturally throughout the Tennessee River system. Most expert catfish anglers here prefer cut skipjack over gizzard shad or other bait. A chunk about 6 inches long is typically used to lure the larger fish. The baits are usually fished on bottom, or just off bottom via a small float between a heavy egg sinker and the bait. Most anglers use 40-pound tackle and up, with heavy spinning reels loaded with braid a favorite with some. Hooks are 8/0 or larger circle hooks, which are said to hook the fish without a hook set, and which make it easier to release the fish alive since they usually lodge in the front of the jaw. Big cats are strong adversaries, and battles of 15 minutes and more are not uncommon with a lunker. However, the biggest problem most anglers face when the fish finally rolls at boatside is how to get it aboard–even the largest landing nets are likely to buckle under a 60-pounder.Gaffing would work, but since the fish are to be released alive, it’s not a good strategy. Some anglers who fish the giants regularly use two nets, placing one over the head, the other over the tail for a combined lift. 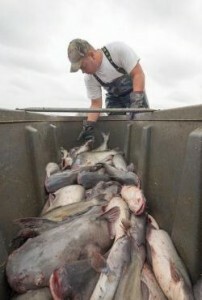 For more on catfish tournaments, visit www.alabamacatfishtrail.com. This entry was posted in catfish, How To Fish, Where To Fish on January 20, 2016 by ronniegarrison. Where Can I Catch North Georgia Catfish? Hot weather and catfish go together like fried fish and hushpuppies. And catfish are one of the best fish to fry with your hushpuppies, too. Summer is a great time to catch some hard fighting, tasty catfish and there are several excellent places to catch North Georgia catfish. From lakes and public ponds to rivers, catfish are plentiful and hungry. Catfish are the ordinary citizen of the underwater world. You can find them in most waters, they aren’t picky about what they eat, tackle does not have to be fancy or expensive, and you can catch them from the bank as well as from a boat. They bite night and day and there are several kinds of cats you can catch in most places. Tackle can be as simple as a cane pole or as fancy as a custom rod and expensive reel. But you can catch them on trotlines, jugs and limb lines, too. Bait ranges from live bream and minnows to stink bait that only a scavenger could love. You can go after frying size fish or try for a trophy weighing over 100 pounds. There is nothing quite like setting out a trotline across a cove, baiting up a few limb lines and then sitting around a fire on the bank with a few rods in holders waiting on a bite. You can pretty much keep as many cats as you want to clean since some species have no creel limit and the ones that do have a limit have a very high number you can keep. Georgia produces some big catfish. 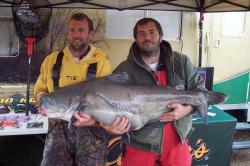 The state record flathead weighed 83 pounds, the record blue cat 80 pounds and the channel cat record is 45 pounds. You may break one of those records. The following waters offer a variety of kinds of places to fish in north Georgia and the chance to catch several kinds of catfish. Also known as Clark’s Hill to most Georgia anglers, this big lake has flatheads, blue cats, channel cats and bullheads. Located on the Savannah River near Augusta, you can find good bank access in several areas and there are many boat ramps to launch and go to secluded coves to fish. The lake record cats show what you might have a chance of catching. The biggest flathead from Clarks Hill is a 64 pound fish caught in 2010. A 62 pound blue cat was landed several years ago and the lake has produced a 25 pound channel cat. There are bigger cats in the lake. I grew up running hooks on Clark’s Hill for catfish back in the 1960s and 70s. We used live bluegill for bait and never caught a flathead since there were none in the lake back then. Fishermen introduced them to the lake and they have grown fast and you have a good chance of catching a 40 pound plus fish. Live minnows and small panfish are the preferred bait for flatheads and the big ones usually stay deep. The Georgia Little River arm is a good place to catch them and concentrating on the old river and creek channels are your best bet. Fish a three inch bluegill on a stout rod and reel loaded with heavy line and you can hook one of the monsters that live there. If you want a really big flathead, use a bigger bluegill. Blue and channel cats will also hit small live bream and minnows. A couple of summers ago Javin English and I put out 50 jug hooks with small bream for bait one night and landed 14 channel cats, all about six pounds each. We put them out in Germany Creek and checked them twice that night. One problem with jugs at Clark’s Hill now is the hydrilla. You have to keep moving them out in more open water or at least near the edge of the hydrilla. Better baits for channel cats include earthworms, chicken liver, shrimp, cut bait and stinkbait. They have smaller mouths than the other species so smaller baits are best. Cut blueback herring, mullet or whole threadfin shad are excellent baits for channel cats and blues will hit those baits, too. Cut bait and stinkbait seem to work best for the blue cats at Clarks Hill. There is good bank access at the Highway 43 Bridge. The river channel swings right in to the bank at the south end of the bridge, the corner on your left before you get to the bridge going toward Lincolnton. You can park there and join the group usually fishing there at night for big flatheads, blues and channel cats. There is also bank access at the other bridge further downstream on Little River and there are many ramps, like the one at Amity Park, where you can fish from the bank. Put in at one of the many ramps in Little River and go up above the Highway 43 Bridge and fish the edge of the river channel for cats. A hot spot is where two channels come together, like the one just above the island upstream of the bridge. The Little River channel comes in from the right going upstream and the Hart Creek channel comes in from straight ahead. Anchor on the point between the two channels and you will catch cats. Also find ditches and small creeks running into either Hart Creek or Little River and fish their junctions. The outside bends of the creek and river channels are also good. Put out several rods with different baits, sit back and let the cats tell you what they want that night. All catfish from Clarks Hill are good to eat and there are no advisories on any species. Bigger blue and channel cats may be tough and better for stews, but big flatheads stay tender and delicious. The Etowah River downstream of the Lake Allatoona Dam is an excellent river for catfish. There is some bank access at bridge crossings and boat ramps but your best bet is to launch a small boat and fish from it. There are channel, blue and flathead cats in this section of the river. You will catch a lot of three pound blue cats and one pound channel cats, but ten pound blues and five pound channel cats are fairly common. River fishing is different from lakes but fish can be found in consistent places. Find a deeper hole where the river forms a pool and the biggest cats will be living there. Logjams or rocks make pools even better. The fish hold in the deeper water and will feed, but they also move to the more shallow water at each end of the pool to feed. The best baits in the river for blues and channel cats are chicken liver, earthworms and stink baits. For bigger blues and flatheads try live or cut shad or live bream. The bigger fish tend to stay deeper so fish the deepest water in the pool with big live baits to entice them. Anchor your boat at the head of the pool and let your bait drift down the slope into the deeper water, or cast into the deep water and fish on the bottom. Also try anchoring in the pool or tying to a shoreline limb and letting your bait drift to the end of the pool where the water gets shallower. Two of the best areas to catch catfish here are just downstream of the Allatoona Dam and near Heritage Park in Rome. There are some good holes near the dam and at the park where the Etowah joins with the Oostanaula River to form the Coosa River. There are no restrictions on eating catfish from the Etowah River and the average size blue and channel cat is good eating, any way you want to cook them. Flatheads are also good at any size cooked any way you like. There are restrictions of one meal per week on channel cats from the Coosa River because of PCB contamination, so if you fish near the junction of the two rivers near the head of the Coosa you should consider releasing most of the channel cats you catch there. The numbers and size of catfish in Lake Oconee often surprise anglers, especially when bass fishermen have their plugs slammed by one. I have caught an 18 pound channel cat on a spinnerbait and a 35 pound flathead on a jig and pig in club tournaments there. If they will eat artificial baits you can catch a lot of big cats on baits they like better. Located on the Oconee River near Eatonton, Lake Oconee offers both bank and boat fishing. You can fish from the bank at any of the boat ramps and bridge crossings on the lake and catch fish. Bridge crossings are especially good around the riprap at night if you suspend your bait a few inches above the rocks so you don’t get hung up on every cast. You can catch blue, channel and flathead catfish as well as bullheads there. The lake has produced a 40 pound flathead, a 34 pound channel cat and a 15 pound blue cat, but much bigger blue cats are in the lake. Bullheads will average about a pound each but are very common. Often called mud cats or yellow cats, bullheads are good to eat but have very red, soft meat. There are also white catfish in the lake and they look a lot like channel cats. Live shad or bluegill as well as cut bait work well for blues and flatheads. For channel cats earthworms and stink baits are good. Night fishing is best on this heavily used lake and the calmer water at night gives you peace and quiet and there is a more consistent bite than during the day. There is a lot of standing timber on the lake and cats live in it, but it is hard to land a big one around it. The best bet is to anchor your boat on a point near the timber and fish on the bottom. Baiting up a hole to draw the fish out of the timber works. You can pour out a bag of rice, put a bag of fish guts on the bottom or throw out some sinking catfish food in advance of your trip then sweeten the hole the day before you go fishing to get them to come to you. Rocky points always hold bullheads and catfish so concentrate on them. There are fish all over the lake but the Oconee River above the interstate bridge has some good holes and channel swings to fish. Anchor on the edge of the river channel where it makes a bend or where a feeder creek or ditch enters it and catfish will be there. There are no advisories or restrictions on eating catfish of any size or species from Lake Oconee. West Point Lake on the Chattahoochee River near LaGrange is one of the best catfish lakes in middle Georgia. There are many two to three pound channel cats in it and they are a good eating size. There used to be a lot of commercial cat fishermen working the lake due to the numbers of fish there, and the fish are still there. Flatheads and blue cats are also in the lake. A 33 pound flathead and a 20 pound blue cat have been recorded at West Point but there are much bigger fish in the lake. Access is good for fishing from the many parks and ramps on the bank and there is a boat ramp close to any part of the lake you want to fish. Yellowjacket Creek, Whitewater Creek and Wehadkee Creek are all good areas to try for channel cats. Your best bet for flatheads is the upper Chattahoochee River. Fish at night around the bridges in Yellowjacket and Wehadkee Creeks but also try the Highway 109 bridge on the main lake. You can fish from the bank around those bridges or tie up under the bridges and fish beside the end pilings. Also try fishing just off the riprap from your boat. For flatheads here and anywhere else live bream are the best bait. For blues and channel cats the usual baits like earthworms, stink baits, live or cut shad and cut mullet works very well. When getting a fish for cut bait, an oily fish like a mullet or shad is best since it will put more scent into the water to attract the fish. The Georgia Environmental Protection Division has no restrictions on smaller channel cats from West Point but you should not eat more than one meal per week of fish 16 inches long or longer due to PCB contamination. McDuffie PFA offers great fishing for channel cats and easy access for bank and boat fishing. There is handicapped fishing access and the seven ponds ranging from five to 37 acres are stocked with channel cats regularly and are fertilized. You will one of the following if you are ages 16 to 64: A 3-day hunting/fishing license, a Wildlife Management Area License, a 3-day hunting/fishing license, a Sportsman’s, Honorary or Lifetime License or a Georgia Outdoor Recreation Pass. The McDuffie PFA is near Thomson and offers concrete boat ramps, restrooms, picnic tables and camping. Shorelines are clean and easy to fish from but you can fish only from sunrise to sunset Wednesday through Sunday. The limit on channel cats is five per day and you are limited to two lines in the water at a time. Best baits are chicken liver, blood and stink baits and earthworms. You are not allowed to use live fish of any kind, including minnows, to fish here. Most channel cats are good eating size but you are not likely to catch a really big cat here. The best bet is to find a sandy bank, set up two lines in the water with one of the above baits on a small catfish hook and light lead and wait for a bite. Fishing is relaxed and simple. You can launch a boat on any of the open ponds and get away from the more crowded bank access areas. Boats are restricted to electric or paddle power only. A gas motor may be attached to the boat but may not be cranked. Find a small drop off or channel with a depthfinder in the ponds and fish around it for the best chances of catching fish. This is a great place to take kids fishing since facilities are convenient and fishing is good. Kids can play when they get tired of fishing, something important when teaching young kids to fish. This entry was posted in catfish, Where To Fish on October 3, 2015 by ronniegarrison. Where and how can I catch catfish in Georgia? If you want variety in your fishing, go for catfish. They are in all our waters so you have a wide choice of places to fish. You can try for small eating size channel cats or you can go for a huge flatheads that approach 100 pounds. And you can use just about any method you want to catch them, from jugs to rod and reel. The following offer a place to catch cats in a wide variety of waters around our state. Check them out for some fun this summer. Located about eight miles east of Thomson and a couple of miles off Highway 278, McDuffie PFA offers seven ponds ranging in size from five to 37 acres. Six of the ponds are stocked with channel catfish. Bank fishing is good and you can use a boat with an electric motor. In most cases you will need a Wildlife Management Stamp as well as your fishing license. The ponds are maintained for easy bank access and offer bank anglers good fishing. Some of the ponds have fishing platforms on the water that are handicapped accessible. Concrete boat ramps make loading and unloading your boat easy. Restrooms on the PFA as well as hiking trails and picnic tables make this a good place for a family outing. Camping is available on-site but fishing is limited to sunrise to sunset. Channel cats are the only cats you are likely to catch here and most will be eating size in the one to two pound range. There are cats up to 20 pounds in some of the ponds so be prepared for a strong fight at any time. You can not use live baits like minnows so stick with earthworms, chicken liver, stink baits and crickets. I grew up less than three miles from the McDuffie PFA and spent many happy hours there. My best luck for catfish came late in the afternoon although cats will bite all during the day. Warmer months were best so right now through the end of September is a good time to go. Find a sandy spot on the bank near the pond dam and drive a forked stick or rod holder in the ground. Cast out a cricket, earthworm or piece of liver on a #4 hook and a light split shot, let it hit bottom, tighten up your line and place the rod in the holder. Watch your line for bites but wait to pick up your rod when the cat starts swimming off with the bait. Channel cats often bite slowly and you can pull the bait away from them if you try to hook them too quickly. This 660 acre lake in a state park is just a few miles east of I-75 north of Forsyth. There is limited bank access at the dam and at the park and boat ramp on the Buck Creek arm, but most fishing is from a boat. Motors are limited to 10 horsepower and two concrete ramps offer easy loading and unloading. You can be on the water only from sunrise to sunset each day. Some big flatheads are caught each year with fish in the 30 pound range showing up fairly often. There are tales of much bigger flatheads, too. I took a picture of a 35 pounds flathead from High Falls that was the state record for a short time many years ago so there can be some huge fish in the lake. But your best bet will be for channel cats. In 2008 there was an exceptional spawn and survival rate and those fish have now grown to a good size for eating. Almost half the channel cats will be in the 12 to 18 inch size and weigh an average of about two pounds. You will have a good chance at a five pound channel cat. The best fishing for all cats will be in the deepest water in the area this time of year. The old channels at High Falls are silted in badly but the depressions formed by them are still the deepest water. A depthfinder helps find this deeper water to concentrate your fishing and the lower lake will be best. If fishing for flatheads a live bream or shad is best, and bigger channel cats will hit them, too. For smaller fish go with cut bait. You are more likely to catch channel cats if you use earthworms or stink bait. Rig up a sinker heavy enough to keep your bait near the bottom and tie your hook on a short leader. Put the bait on a #2 to #4 hook for smaller cats and slowly drift the bait right on the bottom. There is a lot of slimy “moss” on much of the bottom at High Falls and the leader will allow your sinker to stay on the bottom without getting the gunk on your bait. I-20 crosses the upper end of Lake Oconee west of Greensboro and the lake extends south, covering 19,000 acres and 374 miles of shoreline. Access is good for boat anglers at several marinas and public boat ramps, and bank fishermen can fish around bridges and in the parks. The lake is so big a boat is definitely the way to fish. There are lots of channel and white cats and bullheads in Oconee but the population of big flatheads and blues is increasing. Oconee may be the sleeper lake in the state for big catfish. I landed a 20 pound blue cat on a spinnerbait three years ago in Double Branches and a 35 pound flathead on a jig and pig last summer in Lick Creek while bass fishing. If you target cats there is no telling what size you might catch! There are a lot of 15 pound plus blues and flatheads in the lake so use stout tackle if you are fishing for them. Live shad or bluegill are best for the bigger fish but cut bait also works well. For smaller channel cats and bullheads live earthworms are good. Both big cats I caught hit in the middle of the day but late afternoon to early morning is the best time for catfish. On a big lake like Oconee it pays to bait up a hole for them. Pick out a small cove that drops off to deep water and throw out sinking catfish food for several days. Although cats like the standing timber on Oconee, make sure you pick a cove a good ways from it or any big cat you hook will likely wrap you up. Come back late in the afternoon and anchor, cast out several rods baited with live bait, cut bait and earthworms and wait for the action. Offer a variety of kinds of baits and sizes of baits since you may draw in smaller channels or trophy size flatheads and blues. You can fish all night during the summer and catch fish. Although Andrews Lake offers good cat fishing, the best area of it is just below the Walter F. George dam. The bigger cats tend to move up the lake to the fast water in the tailrace just below the dam on the Chattahoochee River and feed there. There is some bank access but a boat is a better way to fish. The dam at Walter F. George is near Fort Gaines. You can catch a lot of ten pound plus flatheads and blue cats here and a real trophy is possible. 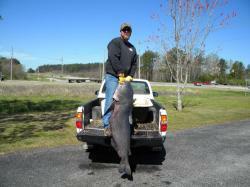 The state record blue was held for a short time by a 67 pound, 8 ounce monster caught just below the dam in 2006. Then in February, 2010 an 80 pound, 4 ounce monster caught here set the new state record. There are good numbers of 40 pound plus blues in the area. Channel cats are also abundant and will average from two to four pounds. For smaller blue and channel cats try earthworms and blood baits fished on the bottom. Bigger fish are used to eating shad injured or killed at the dam so live or cut gizzard or threadfin shad are excellent baits here. Bream and live shad or suckers are best for flatheads but will also catch big blues. During the day fish your bait on the bottom in the deepest water near the Walter F. George dam. At night you can anchor and cast your bait up onto flats and sandbars near the deeper water. The big cats hold in deep water during the day and move up into the shallows to feed at night. Use heavy tackle and a one ounce sinker will often be needed to hold your bait on the bottom in the current. Try to find eddies or slack water where the current washes injured baitfish and let your bait soak on the bottom in those places. Be careful of water release at the dam when fishing from a boat or the bank. Water can rise quickly and become very strong when power is being generated so be aware of the changes. Don’t get caught by rising water and strong currents. Most fishermen think of spotted bass when the Coosa River in northwest Georgia is mentioned, but it is a quality catfish river, too. From its start north of Rome to where it crosses the state line into Lake Weiss, big cats are caught in this river. Boat fishing is the best way to find the fish here since you need to seek out the places they hide. One thing may help to make this river a trophy catfish hole is the restriction on eating big cats from it. The Georgia DNR says you should not eat blue cats over 32 inches long from the Coosa and should limit eating smaller cats, so many of the cats here get released to fight again. If you want a fight the Coosa is a good place to head but if you want catfish to eat you would be better fishing another spot. You can catch blue, channel and flathead cats of all sizes in the Coosa and 50 pound blues are not uncommon. For smaller fish use stink baits, earthworms and liver. For the bigger trophy size cats the best baits are live bream and shad, or cut bream and shad. The Coosa is full of log jams on the bank and big blues and flatheads love to hide in them. Drift a live bream or shad into eddies created by brush and log jams and be ready for a strong fight. Use very heavy tackle to get the fish away from the wood and out into the main river to have a chance of landing it. Deep outside bends in the river where the current creates slack water can be excellent, too. You can anchor on the inside part of the bend and fish your bait on the bottom toward deeper water. Drifting it with the current will also take it to where the catfish hold, rather than waiting for them to come to your bait. But they are going to be harder to get out of the place they are holding since it is likely to be in heavy cover. Also look for current breaks in the middle of the river. Bridge pilings, logs and deeper holes will hold fish. Let your live bream or shad or cut bait drift into those areas and the current will take it right to where the catfish is waiting. Use the current to move your bait in a natural way. These spots offer you examples of the wide variety of cat fishing hole we have in Georgia. Check them out for some fun fishing and, in most of them, good eating. There are many similar lakes, rivers, state parks and Public Fishing Areas around the state to try if one of these is not near you. The same methods that work on these should work on one closer to you. This entry was posted in catfish on September 27, 2015 by ronniegarrison.